One of the best things about living in Sydney is that you have easy access to many different hikes. Most people though don't think past taking a train up to the Blue Mountains. However there are many other public transport accessible hikes that I have done. There is a nice one in suburbs between Epping and Hornsby which is part of the Great North Walk (and a popular bushland area for local teenagers to stash their marijuana plants). 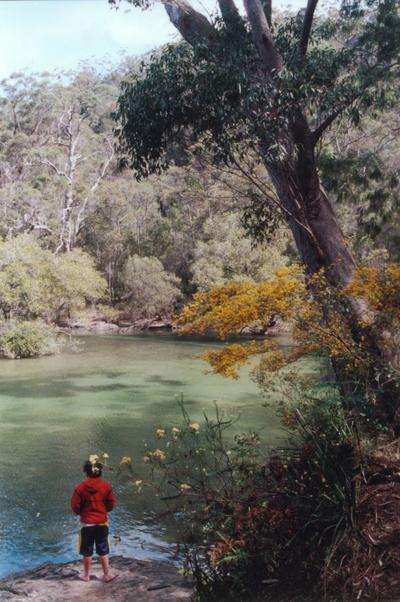 There is also another easy hike between Heathcote and Waterfall train stations in Sydney's south. One that I have been on many times is to Jerusalem Bay on the Hawkesbury. You hike from Cowan Train Station up to Brooklyn where you can enjoy fresh Hawkesbury oysters and a beer in the local pub before taking the train home. Do you have a favourite public transport accessible hike in the Sydney area? Some that I can recall ..
Wentworth Falls via Wentworth Falls Train Station. Waterfall to Heathcote via Waterfall Station. Barrenjoey Lighthouse via Palm Beach bus. I also heard that you can take the ferry from Palm Beach over to the Great Mackerel Beach Reserve where are are walks and even some aboriginal paintings. The ones that comes to mind are the ones that start at Audley in the Royal National Park. To get there you would get the train or bus to Sutherland Station. Then you can either catch a bus or walk to the Loftus Tram Museum and then catch a tram ride to the info centre. From here you can go on a number of different walks. If you are of the more Adventurous type you could walk down to the weir at Audley and start from here. One of the best accessible hiking trails by transport is the Aboriginal Heritage Trail. I have never done this hike even though I have planned to do it on a few occasions.